I came across an interesting post by a chap called Douglas Blane a few days ago. It's another post that focuses on communicating science to young people, focusing on the readability of bodies of text that are used in an attempt to communicate. Which is fair enough, this is indeed, something that need to have attention paid to it. What I feel is missing though is the same thing that is missing from most discussions about science communication. It's all aimed at the young. This is not to say that we shouldn't be focusing on the the young. If we can swing it that the next generation of artists, politicians, mechanics and journalists have a sound understanding of what science is, grand. There does, however, seem to be a dismissal (not just in Blane's post, across most of the science communication literature) of attempting to outreach to the current crop of artists, politicians, mechanics, journalists and the like. The suggestion that there is "no point talking to adults because their mind is already made up". There's an interesting article by Jenny Rohn in the guardian today about perceptions of scientists. It's odd, she talks about societies perceptions of scientists, how, for quite some time, its been accepted that the sterotype is white male boffin. I can't rightly say whether that is the perception or not, it certainly isn't mine. She offers, what I think is a pretty accurate description of scientists, i.e. a varied mix of people ranging from scruffy to trim, most of us pretty focused on work, not particularly out of the ordinary socially speaking. And there is a rough sketch of scientists as they have been appearing in movies for several years, distinctly boffin like. The interesting bit it think, is that she suggests that the boffin stereotype is what scientists perceive as societies perception of us and that scientists themselves are worried by this. This is where I think she's wrong though. The topic of conversation amongst the scientists I know, is very rarely about how society perceives us as individuals. It is much more about how society perceives science (badly, in the sense of incorrect rather than good/bad) or more commonly, about how the media, be it movies of newspapers portray or represent the actual science itself (almost universally, appallingly). The concern is not whether we're thought of as boffins or not, but rather how our work is presented and used. Which is as it should be. Though I have to say, I've always been rather fond of the word boffin. Boffin. bah. every time I try to write I start with a nice simple idea which I try to generalize a bit that ends up full of caveats and being incredibly general. For example. I'm thinking about science communication. I try to start exploring the fact that there isn't, as far as I can see, much in the way of science communication aimed at the population in general. There's a bit, slowly increasing that is aimed at teenagers, which is good, but to the general population, there is bugger all. Fine, I say to myself, I shall expand on that a little. Why should there be such communication I ask myself? Well, for one, we might get slightly fewer god awful stories in the media that leave huge bits of the story out or completely misrepresent the statistics. Which would be nice. Pretty soon though, I realize that while this is something that I think is important, others might not think so. So I rattle off into an exposition about why I should be pushing a view that I think it is important on others. And this pretty soon leads me miles away from what I think I was wanting to write in the first place. By this time of course, I can't quite remember what it was that I was wanting to write and i end up chucking it all in the bin. At some point in time, I am going to learn how to figure out not to worry about worrying whether I have a right to push my views on others. It's a silly thing to contemplate, especially in a forum like this. I'm not forcing anyone to read this. This is nothing more than an layout out of my views on various matters. I think they're right. Or at least, can be justified. And I'm quite happy to point out the problems in my own thinking. One day, someone might read this and enlighten me as to solutions to these problems. Or not. I am currently doing a bit of work web work for for LENscience, a science communication group that is part of the Liggins Institute. They're good at what they do (though the website needs updating (cue me), which is communicating science to schools, students and teachers alike. And I came across this this morning. Which is another admirable and successful attempt to engage with young people. There numerous endeavours to get scientists and teenagers connecting, which is grand. One of the sentiments that I wholeheartedly agree with is "the majority of today’s teenagers are not destined to become scientists, but they will all be people and citizens." A population base with a sound knowledge of how science works is, I believe, essential to a rational society. Where then, are the organisations dedicated to reaching the population today? It's all geared towards teenagers. Which might, end up influencing some parents, but it's not really communication of the concepts or of what is happening in science these days. There's Café Scientifique, which might be working in other cities, but here in Auckland, it's something you have to search out. If you don't know it's there, there is nothing. science has no importance or value until it enters the outside world. That’s where it takes on meaning and value. And that’s where its meaning and value must be explained. And while I might have a few ideas to if not solve then at least, lessen the problem, I certainly don't have the funds. For now, I think I might just get a t-shirt made with "Scientist" printed on it and try and to sensible answer some of the questions that come my way. I was about to write something that was rather self absorbed. I'll leave that for a private piece of writing sometime. A few days ago Jerry Coyne, wrote a piece on a question that he gets asked quite often. I find it sad, that these are not the questions I get asked. The questions I get asked usually revolve around segments that people see on programs like 60 minutes, 20/20 or close up. They are usually about drugs that the government won't fund, sprays that are supposedly causing major health problems, people regrowing fingers or miracle cures that the evil pharmaceutical companies are trying to prevent people from finding out about. And then one offers the opinion, that, perhaps, one shouldn't be relying on a 10 minute segment from shows that are based around trying to achieve ratings rather than educating people, there's that wonderful slide off into "scientists don't know everything" and "it's just a theory isn't it". Which just makes me want to scream. I'm not the best at coming up with arguments on the fly. I've spent the past year or so trying to drill some common responses to some of the more common questions into my woeful memory, but I generally prefer to take my time, mull things over, make sure what I'm thinking has some sort of valid structure to it. Which is why I generally refuse to talk science when I'm out socially. There are exceptions, good and bad. The good being when there are other scientists at the party. I'm fairly lucky with this, my social circle (outside of school) has, randomly, probably a higher percentage of scientists than one would expect to find elsewhere. One can usually be guaranteed that there will be a modicum of logic behind whatever position they advance. The other side of the coin, is the believers in psychic woo, occasionally blindside me with conversations that start out innocuous and end up with me trying to point out very basic flaws in their thinking. I have to say though, I still have difficulty getting over my incredulity at individuals that in all other resepcts appear sane, who believe in fairies at the bottom of the garden. Finally got to go through the tempering process and finish my first blade today. 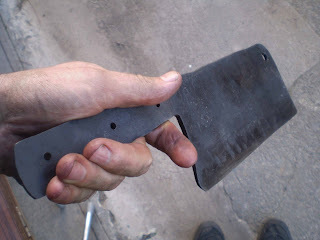 It's the fairly medieval looking cleaver. I deliberately left in a lot of the hammer marks and scaling, I thought it looked better. Now it just needs the wooden handle (which I'm hoping to get Dad to do) and a chopping block on which I can use it. It's sufficiently heavy that if you let it drop from about 3 or four centimeters, it leaves a fairly large-ish dent in a chopping board. That's as it should be though. As far as I can ascertain, a cleaver should rely on its weight rather than its blade to do the cutting. Cleavers in the western tradition at least. The heat treating is an interesting process, as was noted today, one of those processes that makes you wonder how on earth someone thought it up. heat up, cool, heat slowly from the back of the blade, then cool again. Large amounts of fun though. Hanging out for when Jon or I can afford the belts for the linisher so that I can finish polishing off the blade and put that through the tempering process. After heating and pasteurizing the milk, which is simply killing whatever is currently living in it, the first step in the cheese making process is to separate the curds which will make up the cheese, from the whey. To understand what is going on here, we need to understand what is in milk, i.e. what is milk made up of? The important parts of milk, or rather, the parts of it that are of primary concern in making cheese, are water, fat and lactose. Lactose, we'll come to later. For now we need to concentrate on the water and the fat. Water and fat don't mix. 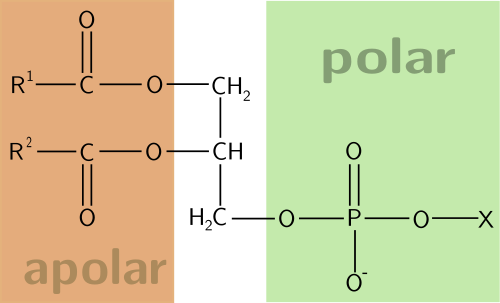 At the level of molecules, water is polar. Which is to say that the charge is spread unevenly over the molecule with one end tending to be positive and the other negative, due to the possible arrangement of atoms with respect to other and the relative strength of the atoms charges. 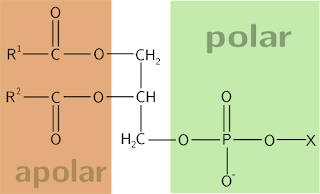 The end result is that water, being polar, can arrange itself in a comparatively orderly manner with other polar molecules such as water or sugar. That order is disturbed however by non-polar molecules such as fats, which have the charges of the constituent atoms, relatively well spread. The two types of molecule are called, respectively, hydrophilic and hydrophobic. Yet milk is a mix of fat and water. How does this work? The fat molecules in milk are hidden from the water by Casein. Casein is a very common amphiphilic protein present in milk. And amphiphilic molecule has one end that is hydrophobic and one that is hydrophilic. One end like water, one doesn't. These molecules naturally clump together into small structures called micelles, small roughly spherical bodies with their hydrophilic portions facing outwards and their hydrophobic portions facing inwards. These small bodies form an ideal place for hydrophobic fat molecules to hide from the water molecules. In addition, all hydrophilic parts of casein are all negatively charged, which keeps the micelles away from each other. How are the curds separated from the whey then? Acidic solutions, with an excess of H+ donate that proton to the negatively charged part of the casein molecules. This allows the casein molecules to clump together. As more and more of the disrupted micelles clump together, they become visible. These visible clumps are the curds. The voice of old New Zealand. the last year or so, I've been reading more and more on the history of my country. I think I'm beginning to pick up Dad's reading habits, histories and biographies. I think it probably started with Richard Stowers Forest Rangers. Belich's The New Zealand War and King's History of New Zealand. I've even been lucky enough to pick up a couple of Hone Tuwhare books. Every so often though, one comes across a name hasn't heard before and has to add him to the list. I already have Frank Sargeson and Janet Frame on my list, though I'm not sure which ones. I think I want to read one or two of their works, just because they are notable New Zealanders and thus I feel that I really should have, at least, a passing familiarity with their work. Now, add to my list, A.R.D Fairburn. Getting his works in hard copy appears to be a little beyond my means at the moment, so I'll have to settle for an online version. Which one hopes will be sufficient. This is interesting me a bit lately. It started with the idea that when I'm making my mozzarella, I should be aiming to get the pH of the mixture down to 5.2. So, I'll start from the beginning. What is pH? is a measure of acidity or baseness in chemistry. It is roughly equal to the negative log of the concentration of H30+. H30+, otherwise know as a hydronium ion, occurs naturally in water. Every body thinks water is just H20. And in one sense it is. As with most things in chemistry, there's a little more to it though. Water, is a mix of H2O, OH− and H3O+. The last two of these exists in very small amounts, but they are there. Water molecules are continually bumping into each other, giving away and receiving protons (H+). H3O+ has an extra H+, making the molecule positive, so it tends to give away it's extra H as soon as it can, it becomes a proton donater, an acid. In plain old water, there is, on average, equal amounts of OH− and H3O+, which means it all balance out and you get a neutral solution. When something else is in the solution though, it can disturb the balance. If something occupies the OH− molecule, there is nowhere that the H3O+ to get rid of it's extra it's proton. The solution now has a greater concentration of of H3O+ and thus becomes acidic. All this is important, trust me. Acid has many roles play in the process of making cheese, the next post will show the first of it's roles: curdling the milk. I think these first few posts are going to questions. Not big, deep and meaningful questions. Little questions, a lot of them food based at the moment. Like, "what happens, chemically, when I put salt on the curds during the cheese making process?" Or, "how does each step of the mixing process contribute to the final baked cake?" I find more of these questions being asked in my head these days. And it brings home the fact that I don't have the means to answer all of the questions I want to ask. My knowledge of chemistry is sadly lacking. I have the basics, but not the means with to test any surmise that I might come up with. The writing, helps, but I have languished in my learning for so long, focuses only on one field, biology. There is so much to learn. So little time. And I get tired and distracted so easily. Time that could spent going over basic maths or chemistry or reading important works is wasted with napping and watching amusing yet pointless television shows. I don't know how many times I've read this article. Not this particular one. This one in general. the one that says you have to write to be successful. The trouble with it is that I completely agree. I just don't. That's even what the two or three blogs that I've set up over the years have technically been for, so that I can practice writing. And then I don't. I'll admit, there's a couple of things recently that have got me wanting to write a bit more. Cooking for geeks for one. The whole thinking about food scientifically, thinking about the reactions between ingredients, what happens when heat is applied or taken away. That sort of thing. I still don't though. The writing that I have been doing of late, has been for study. Handwriting, in books. Primarily, I think, because the exams have to be handwritten and I need my hands to be able to cope with it. It is quite therapeutic, I must say. It's helped my retention significantly I think. And it makes one feel as if one were actually doing something. Maybe because I am.